Dr Lobsang Tenzin Negi, officiated the closing ceremony of the SEE launch followed by presentations on the internet curriculum of SEE project. Ms Tyralynn Frazier delivered a short presentation on the structure of the curriculum which consisted of 7 modules and explained each module individually. 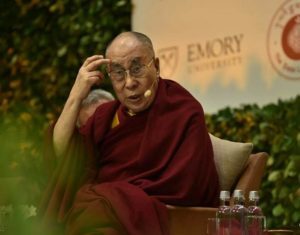 Dr Garry Hawk former vice president of Emory University who is also a major contributor towards the project marvelled on the friendship shared between Emory University and His Holiness the Dalai Lama while dwelling on the history of Emory University. His Holiness delivered a keynote address on “Preparing Children for a Changing world: infusing Discernment and Compassion into Education”. His Holiness called for global responsibility meanwhile abstaining self-centred attitude. He firmly declared that the benefit of thinking of others well being is invariably the most noble deed that human brothers and sisters could do for each other. In fact, His Holiness firmly believed that taking care of others is actually taking care of yourself. The existing education as His Holiness perceived is not adequate to inculcate the basic human values therefore a serious discussion on education has become a pressing need of today. His Holiness encouraged constructive living and dissuaded destructive living. “People should think more about well being of others including environment to become more constructive. If people think of oneself and be selfish and narrow-minded then human being becomes destructive”, alerted His Holiness. Once again, His Holiness emphasized on utilizing the wonderful gift of Intelligence possessed by human towards the welfare of humanity while endowing the young generation grave responsibility of effecting a peaceful and harmonious world. 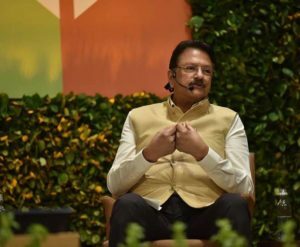 Mr Ajay Piramal, Chairman of the Piramal Group addressing the gathering as one of the panellists. Photo/Tenzin Jigme/DIIR. 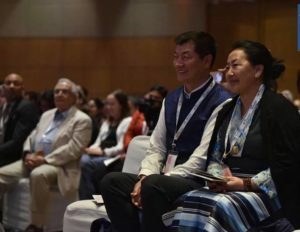 CTA President Dr Lobsang Sangay and Education Minister Dr Pema Yangchen amongst the distinguished guests. Photo/Tenzin Jigme/DIIR.